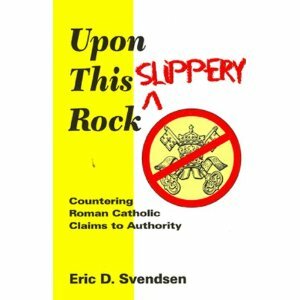 The following is a brief excerpt from Eric Svendsen's book, Upon This Slippery Rock, Countering Roman Catholic Claims to Authority (New York: Calvary Press, 2002) pp. 74-76. This is posted because a few Roman Catholic bloggers decided to tell me what they think "private interpretation" means for Roman Catholics. This book can be purchased here. I INCLUDE this section because there are many Roman Catholics who deny that they argue in the way this book represents. 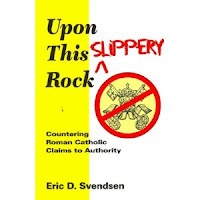 When confronted with these epistemological fallacies, rather than present a defense of the Roman Catholic view, they claim that the fallacies are meaningless since Rome has never condemned private interpretation in the way this book suggests. I have included writings from Trent, Vatican I and Vatican II, to demonstrate the contrary; namely, that Rome really does condemn private interpretation, and that individual Roman Catholics really do commit the epistemological fallacies we have enumerated. I have italicized text within each council's documents to draw attention to the relevant points. Where clarification of a point is necessary, I have interspersed my own comments, offset in bracketed italicized text. "Likewise I [the Bishop of Rome] accept sacred scripture according to that sense which holy mother church held and holds, since it is her right to judge of the true sense and interpretation of the holy scriptures; nor will I ever receive and interpret them except according to the unanimous consent of the fathers" (Session II, 3). "Everybody knows that those heresies, condemned by the fathers of Trent, which rejected the divine magisterium of the church and allowed religious questions to be a matter for the judgment of each individual, have gradually collapsed into a multiplicity of sects, either at variance or in agreement with one another; and by this means a good many people have had all faith in Christ destroyed" (Session III, 5). "Furthermore, in order to restrain petulant spirits, It decrees, that no one, relying on his own skill, shall,—in matters of faith, and of morals pertaining to the edification of Christian doctrine,—wresting the sacred Scripture to his own senses, presume to interpret the said sacred Scripture contrary to that sense which holy mother Church, —whose it is to judge of the true sense and interpretation of the holy Scriptures,—has held and does hold, or even contrary to the unanimous consent of the Fathers; even though such interpretations were never (intended) to be at any time published. Contraveners shall be made known by their Ordinaries, and be punished with the penalties by law established" (Session IV, "Decree Concerning the Edition, and the Use, of the Sacred Books"). "But the task of authentically interpreting the Word of God, whether written or handed on, has been entrusted exclusively to the living teaching office of the Church.... It is clear, therefore, that sacred tradition, sacred Scripture and the teaching authority of the Church, in accord with God's most wise design, are so linked and joined together that one cannot stand without the others, and that all together and each in its own way under the action of the one Holy Spirit contribute effectively to the salvation of souls." ("Dogmatic Constitution On Divine Revelation" [Dei Verbum] II, 10). "To search out the intention of the sacred writers, attention should be given, among other things, to `literary norms.' For truth is set forth and expressed differently in texts which are variously historical, prophetic, poetic, or of other forms of discourse. The interpreter must investigate what meaning the sacred writer intended to express and actually expressed in particular circumstances by using contemporary literary forms in accordance with the situation of his own time and culture. For the correct understanding of what the sacred author wanted to assert, due attention must be paid to the customary and characteristic styles of feeling, speaking and narrating which prevailed at the time of the sacred writer, and to the patterns men normally employed at the period in their everyday dealings with one another." (Ibid., III, 12 ["Sacred Scripture, Its Inspiration and Divine Interpretation"]). "For all of what has been said about the way of interpreting Scripture is subject finally to the judgement of the Church, which carries out the divine commission and ministry of guarding and interpreting the Word of God" (Ibid.). "The bride of the Incarnate Word, the Church taught by the Holy Spirit, is concerned to move ahead toward a deeper understanding of the sacred Scriptures so that she may increasingly feed her sons with the divine words. Therefore, she also encourages the study of the holy Fathers of both East and West and of the sacred liturgies. Catholic exegetes then and other students of sacred theology, working diligently together and using appropriate means, should devote their energies, under the watchful care of the sacred teaching office of the Church, to an exploration and exposition of the divine writings" (Ibid., VI, 23 ["Sacred Scripture in the Life of the Church"]). Have't you just indicted the first christians of committing an epistemological fallacy since they were not permitted to interpret scripture contrary to the apostles? No. The Apostles functioned in a period of enscripturation, and were actually speaking the very words of God (because they were being given special revelation). In this sense, they were not interpreters of divine revelation, but rather a vehicle of divine revelation. I didn't say anything about the apostles interpreting anything. Weather they did or not is irrelevant. We frequently encounter RCs who promote Rome with her magisterium as preventing the divisions seen in Protestantism ( though they almost always include any church that is not in communion with Rome as being so), which they ascribe to reliance upon fallible human reasoning, since we have no assuredly infallible magisterium to interpret Scripture, that being is our supreme doctrinal authority. However, RCs themselves have not only made a fallible human decision to submit to the self-proclaimed infallible magisterium of Rome, but as they have no infallible interpreter of this, their supreme doctrinal authority on earth, then they must rely upon fallible human reasoning (that of their own and the non-infallible and often conflicting magisterium) to not only judge which of the potentially hundreds of infallible pronouncements really are so (so that they may provide the necessary assent of faith), but to varying degrees the meaning of these and the multiplicity of non-infallible teachings. In addition to a lack of magisterial perspicuity, is the lack of comprehensiveness, leaving many things which Catholics can and do disagree on. And as only a few verses of Scripture are typically judged as having been infallibly defined, then within the parameters of Rome's teaching (as the Catholic fallibly understands her) the Catholic has great liberty to interpret (and to wrest) Scripture in order to support Rome. And due to the degree in which Rome's teachings can be interpreted, she has her own formal divisions, such as the SSPX and sedevacantists which reveal this. In addition are the formal divisions between churches which operate under the Roman model of sola ecclesia, in which the church is effectively the supreme authority, which includes cults. And thus under sola ecclesia respective magisteriums can autocratically infallibly interpret tradition, Scripture and history as supporting her. That is to say, that Rome cannot be in error as she defines what error is! While Protestantism, which should be at least reduced to churches which hold to the supremacy of Scripture as the assured Word of God, as per its basic conservative Scriptural "tradition," also suffer disagreements and formal divisions, they also overall affirm and contend for certain core truths, and have their own magisteriums which also require such and limit the degree of varying interpretations in secondary issues. And such believers effectually are seen to have more unity in Scriptural moral views and certain core truths than their Catholic counterparts. I would disagree- the question was not good, because it contained a false premise, which is what my answer on June 30 pointed out. I don't see how you pointed it out when it isn't there. As I said, I said nothing about the apostles interpreting scripture. My focus is on 'understanding' not on how they arrived at that understanding, i.e., wether by interpretation or revelation. Likewise your focus was not on how they arrived there either. 2) that functioning in private interpretation is not compatible with the position that Rome holds, i.e., not permitting any interpretation that is " contrary to what the Roman Catholic church has decided the meaning is". 1) All early christians function in private interpretation. 2) The apostles did not permit any early christian to interpret scripture in a way that was contrary to the Apostolic understanding. Ergo, you establish that those listening to Paul's teaching and TESTING him by scripture, are committing an epistemological fallacy. I would say you/Svendsen have misunderstood those quotes from Catholic sources. The key passage is that we must read Scripture "according to that sense which holy mother church held and holds" meaning the Church sets the parameters and we must stay within them. Again: the Catholic cannot "presume to interpret the said sacred Scripture contrary to that sense which holy mother Church has held". And finally: "Catholic exegetes then and other students of sacred theology, working diligently together and using appropriate means, should devote their energies, under the watchful care of the sacred teaching office of the Church, to an exploration and exposition of the divine writings". In other words, the Bible is not something everyone is free to pick up and decide whatever they see fit about the Christian faith. The Bible is a book that belongs with and cannot be divorced from the teaching office of the Church. What you and Protestantism are advocating is a Christianity where everyone starts from zero and derives "Christianity" to their own whims. There is no unifying set of dogmas to build around. The difference between SS-type churches and Roman Catholicism is the basis upon which one ascertains and obtains assurance of Truth. The former realizes that while apostles were Divinely inspired when teaching or preaching the Word of God both by mouth, (1Thes. 2:13) or by pen, (2Pt. 3:16) yet in establishing they preaching the Word of God they treated Scripture as the standard for testing and establishing truth claims, by text and in power, as seen by their (and others) abundant referencing of Scripture, and by the supernatural attestation Scripture reveals being given to truth (and which believing the gospel also effects). In Roman Catholicism, the magisterium presumes the veracity of the apostles, not as Divinely inspired but as Divinely protected from error in her “infallible” mode, though the veracity of Rome's teachings are not dependent upon the weight Scriptural warrant, nor does her claimed protection from error extend to the arguments or reasoning behind infallible pronouncements. Assurance of doctrine is not allowed to be based upon one searching the Scriptures, as men such are ordinarily not protected from the infirmity of fallible human reasoning. (FHR) Instead, assurance of the veracity of the infallible pronouncements rests upon the premise of Rome's claim to assuredly infallibility, in which she has infallibly defined that she is infallible whenever she speaks in accordance with her infallibly defined (scope and subject-based) criteria. However, just as Protestants cannot claim infallibility in interpreting their supreme authority (Scripture), neither can RCs in interpreting theirs (the magisterium), and interpretation is required, as said, even in determining which of the potentially hundreds of infallible pronouncements really are so (so that they may provide the necessary assent of faith), as well as to varying degrees the meaning of these and the multiplicity of non-infallible teachings. And disagreement is allowed to some extent (open to interpretation) as regards the latter category, once one has determined which of the different levels a magisterial teaching, or parts thereof, fall under. Therefore, both Roman Catholics and Protestants engage in interpretation, but issue is the warrant for the claims of the respective supreme authorities. Under the Roman model, writings could not be established as Scripture, nor assurance of Truth obtained, and thus she maintains her claim to supremacy based upon her claim of assured infallibility, under which she can infallible decree Tradition, Scripture and history as supporting her. According, challenges are dismissed based upon the premise that it is impossible opposition could ever be right (Scripture may be appealed to in support, or as not contradicting it, but Scripture only means what she authoritatively says it means, and thus Rome is effectively the supreme authority). In addition, Rome also often dealt with theological opposition by torture and similar unScriptural means. Under the SS model, truth is established upon the weight of Scriptural warrant. While this allows challenges, evil is overcome by good, by evidencing conflation with supernaturally established Scriptures in text and in power, and requires the church to not simply claim to be that of the Living God, but to manifest it. Which i and we need to do much better. "according to that sense which holy mother church held and holds" meaning the Church sets the parameters and we must stay within them. The Bible is a book that belongs with and cannot be divorced from the teaching office of the Church. Rather, as said, because of holding Scripture supreme, each respective Christian denom has their own magisteriums which require assent to certain core teachings, based upon Scriptural means of establishment, by which aberration are marked and contended against, while varying degrees of interpretation are allow according to a hierarchy of truths. And Rome is no different. Her interpretation of Tradition, history and Scripture has significant differences with other Catholic groups and churches and others who operate under her sola ecclesia model, which also claim to be the one true church based upon their interpretation. And while certain core truths require assent of faith, Rome allows varying degrees of interpretation according to her "hierarchy of truths." In Catholicism, those who dissent from many of the "unifying set of dogmas" are perhaps close to the majority, but are treated as members in life and in death (the so-called "self excommunication" effectively apparently meaning nothing), while other RCs see the hierarchy as itself being in critical denial of "unifying set of dogmas," resulting in Catholic schisms, in addition to the Orthodox who also claim to be the one true church. In addition, the "parameters" Rome sets for you to stay within does not prevent RCs having a great amount of liberty to interpret Scripture in seeking to support Rome, nor do her broad guidelines regarding interpretation prevent conflicting interpretations even in approved commentaries, or RCs carelessly wresting Scriptures in seeking to support traditions of men (esp as regards Mary) with Scripture. And under sola ecclesia the things in which Catholics can disagree on are abundant. As regards, "the Bible is a book that belongs with and cannot be divorced from the teaching office of the Church," that sounds good, but the fact is that her teachings are not dependent upon the weight of Scriptural warrant, but that they at least do not contradict it, according to her judgment. Meanwhile, even without one centralized formal magisterium, rather than doctrinal anarchy, due to a Scripturally based regeneration and relationship with Christ, evangelicals manifest the unity of the Spirit across denominational lines in many ways, and yet (in this late hour) testify to greater unity overall in many important moral views and teachings. Nick wrote: "What you and Protestantism are advocating is a Christianity where everyone starts from zero ..."
" ... and derives "Christianity" to their own whims." And, of course, that's not what Protestantism suggests. It suggests that we must follow the Scriptures.
" ... the Bible is not something everyone is free to pick up and decide whatever they see fit about the Christian faith." If they are just deciding "whatever they see fit" they are not following the Bible. If they are following the Bible, they are not just deciding whatever they see fit. "The Bible is a book that belongs with and cannot be divorced from the teaching office of the Church." The Bible is God's Word, not the church's word. It saddens me that I see both protestants and catholics engaging in these kinds of twisting of others words. Thank God it speaks more of the person than it does of their respective belief system. In reply to the rest of your points, you don't seem to be taking into consideration the need of an interpretive standard. Don't you think that someone needs to set the standard of what "following the bible" looks like? Nick: "The Bible is a book that belongs with and cannot be divorced from the teaching office of the Church." TurretinFan: The Bible is God's Word, not the church's word. I don't know what that has to do with what Nick said. The bible and the church both belong to God. It would not be a denial that it is His word if He entrusted the church to guard it and to interpret it. If so then how so? The short answer to your question is that you are right - it doesn't need to be a contradiction. The problem is that Nick loads into "teaching office" the idea of an authority over the text, an authority that belongs to the master, not the servant. I wrote: "It is interesting to see this frank admission from Nick of what value he assigns to the Scriptures"
You replied: "It saddens me that I see both protestants and catholics engaging in these kinds of twisting of others words. Thank God it speaks more of the person than it does of their respective belief system." "In reply to the rest of your points, you don't seem to be taking into consideration the need of an interpretive standard." You see, you too view the Bible as "zero" on its own - as though it does not provide its own interpretive standard. This is simply the postmodern skepticism I mentioned earlier, in which the writing itself cannot communicate truth without an external authority. "Don't you think that someone needs to set the standard of what "following the bible" looks like?" The answer, of course, is that the text itself provides the standard, just like the text of Homer's Odyssey, the text of Bede's Ecclesiastical History, and the text of Wilder's "Little House on the Prairie." You can figure out what those texts say and mean without an external authority over the text. The same is true of Scripture. Do you mean the bible provides it's own rules of interpretation? That would only be true if you didn't need to bring your own outside sources to it i.e., your own preferred interpretive framework for example. Nobody interprets the bible purely on it's own explicitly stated terms. Nobody interprets the bible purely on it's own explicitly stated terms. Just for clarification, this statement must be taken as a whole. I am not making the claim that every body or anybody is ignoring explicit claims in the bible. Simply that it is not possible to approach the bible without do so through a lens which originates outside of scripture. it is not a false insinuation. The fact is Nick never made any statement to the effect that scripture is zero. You implied that he holds to that view when you referred to him as making the admission. The reality is, you just want to say that his understanding equates to that. Nick never stated any such belief about scripture. Simply stated, it is your opinion. All I am really saying is that Scripture is to be read and interpreted within the context of an ecclesial body. You can study the Scripture at home during personal time, but ultimately that must lead back to reading and interpreting it within the context of a congregation. This is why Paul says Scripture equips "the Man of God", since Scripture is the tool of the Pastor within the context of the congregation. Private interpretation entails each Christian building their own lists of dogmas on their own, and only then joining up with like-minded Protestants to the extent their interpretations agree. It is exactly the reverse for Catholicism. "Do you mean the bible provides it's own rules of interpretation?" The reformation confessions and catechisms are not products of ecclesial bodies? Please. Ok so what you got? Where did you see that point denied? Nick is explaining the quotes which are addressed in the related article. The N.T. treats historical narratives as literal events, including events mentioned below, which is contrary to much of RC scholarship under sola ecclesia, including the officially sanctioned notes in the official RC Bible for America. In which under, “Literary Genres” informs us that Genesis 2 (Adam and Eve and creation details) and Gn. 3 (the story of the Fall), Gn. 4:1-16 (Cain and Abel), Gn. 6-8 (Noah and the Flood), and Gn. 11:1-9 (Tower of Babel: the footnotes on which state, in part, “an imaginative origin of the diversity of the languages among the various peoples inhabiting the earth”) are “folktales,” using allegory to teach a religious lesson. Likewise it states that the story of Balaam and the donkey and the angel (Num. 22:1-21; 22:36-38) was a fable, while the records of Gn. (chapters) 37-50 (Joseph), 12-36 (Abraham, Issaac, Jacob), Exodus, Judges 13-16 (Samson) 1Sam. 17 (David and Goliath) and that of the Exodus are stories which are "historical at their core," but overall the author simply used "traditions" to teach a religious lesson. The footnotes regarding the Red Sea (Ex. 10:19) informs readers that what the Israelites crossed over was the Reed Sea, which was “probably a body of shallow water somewhat to the north of the present deep Red Sea.” Thus rendered, the miracle would have been Pharaoh’s army drowning in shallow waters. All of which impugns the overall literal nature the O.T. historical accounts, and as Scripture interprets Scripture, we see that the Holy Spirit refers to such stories as being literal historical events (Adam and Eve: Mt. 19:4; Abraham, Issac, Exodus and Moses: Acts 7; Rm. 4; Heb. 11; Jonah and the fish: Mt. 12:39-41; Balaam and the donkey: 2Pt. 2:15; Jude. 1:1; Rev. 2:14). However, they are clearly driving on the left. I don't know how this proves that the bible provides "its own interpretive standard". I wouldn't argue that we are not able to derive some interpretive rules from scripture, in fact I would be interested to see a study like that. I would agree that we can derive the rule that somethings are to be taking literally while others are to be taken as a metaphor. Like wise we can derive the law of non-contradictions as an interpretive rule from scripture. Both are simply implied. - Consulting the history of the times. These two alone would control how we ultimately interpret scripture. Yet neither one is mentioned in scripture let alone detailed as a means for interpreting scripture. Re. rules of interpretation, to cut to the chase, start with WCF Chapt. 1 on Scripture and the corresponding scripture proofs. Why, Nick? You haven't demonstrated any real handle on what protestantism actually teaches so far, so what has changed? Even you would have to admit it is a pretty cursory treatment of WCF1. Sorry for not seeing your response, but as regards "there are standards which are not derived from the text of scripture but rather are followed as a matter of logic," logic, which Jesus often appealed to, is itself provided for by Scripture, but with it being the supreme judge of conclusions as the assured Word of God. Among many other lessons which Scripture implicitly teaches, and which also provides for the magisterium, but not as assuredly infallible as per Rome. ...and that there are some circumstances concerning the worship of God, and government of the Church, common to human actions and societies, which are to be ordered by the light of nature, and Christian prudence, according to the general rules of the Word, which are always to be observed. As regards the article on Westminster, which concludes that formal sufficiency means Tradition and infallible Church are good but ultimately unnecessary, under the premise that all all the revelation necessary for the Church is present and clearly enough in Scripture (even if by logical deduction of what is explicit in Scripture) so that neither Tradition nor the Magisterium are needed in order for anyone to understand the will of God, i think this is an imposed or disputable understanding of FS, while most would agree that the salvific truths of Christianity are clear enough that they can (not necessarily will always be) normally be understood, in a due use of the ordinary means, without Tradition nor the Magisterium. And i do not think Westminster is saying that formal sufficiency means that tradition (such as the understanding of the ancients, or modern commentary or other helps) and the church are superfluous and not necessary, nor that God cannot "lead" souls by His Spirit in determining His specific will (just wait until the offering), as formal sufficiency is limited in the sense and scope of what it formally provides, and thus there is material sufficiency. Therefore Westminster acknowledges the use of reason, church councils etc., and the working of the Holy Spirit in discerning truth, as in recognizing the canon. The Roman Catholic seems to hold that it is the church which is formally sufficient, which is a tough sell according to their FS definition, and the issue is its assuredly infallibility, which Rome argues is necessary. However, Scripture clearly shows that an "infallible Church" is not necessary for the preservation of truth, as most of the writings we hold as Divine were established as Scripture (and truth preserved) before there was a church in Rome. As for oral tradition, since Divine revelation began to be written then Scripture is evidenced to have been the supreme transcendent standard for obedience and testing Truth claims as the assured Word of God. And thus additional writings were established as Scripture in conflation and complementarity to what was prior written, in text and in power, and therefore we have the approx 260 quotes and hundreds of allusions to the O.T. in the New, along with the manner of authority given to the O.T. Scriptures. And like as true men of God are, writings which we Divine became established as Scripture essentially due to their Divine qualities and attestation. Though they should be recognized as of God by those who are its stewards, the authenticity of both writings and men of God are not dependent upon the sanction of men who have positional authority, but men of God are established by Scripture, as well as attest to its power. And thus (as said before) the church began in dissent from those who also effectively claimed superiority over Scripture, and taught as doctrines the "tradition of the elders," and thus rejected the authority of John the Baptist and the Lord Jesus. It is true that men such as Paul orally preached the Word of God (1Thes. 2:13) but that was not of eons-old stories but preaching of Scriptural truths and new revelation that were substantiated by it, in text and in power. (Acts 17:2; 28:23; Mk. 16:20; Heb. 2:3,4) in recognition that what was written was supreme as the established Word of God. And the command to keep oral truths referred to in 2Thes. 2:15 was communicated by Scripture, and there no proof that the were not subsequently written, as was the norm, nor can Rome prove that her amorphous oral traditions are all true, and instead she declares they are by fiat. Even when it is allowed that something that is not written can be the word of God (as in 1Cor. 12:8), it is subject to proof by Scripture, (At 17:11; 1Thes. 5:21) it being the established assured word of God, while SS preachers can be said to preach the Word of God in the sense of preaching the truths of Scripture, and in Acts 8:4 the whole church preached the Word. Nor can Rome claim the manner of supernatural attestation given to Moses, the Lord and the apostles, and while she presumes to make oral tradition equal to Scripture (as the Word of God) based upon her (self-proclaimed) infallibility, claiming that is how Scripture came to be as some of it first existed orally, yet contrary to Scripture she totally excludes any of her oral Tradition being added to Scripture. As for "nowhere does the Bible list what books belong in Scripture," it does not need to, any more than it needs to provide the names of all the angels in Heaven (whose words must also be examined in the light of Scripture), but as it evidences the recognition of O.T. 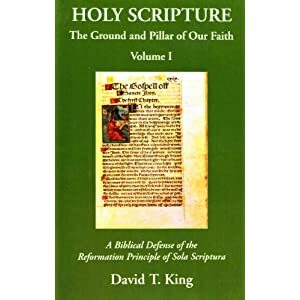 books as being wholly Divinely inspired Scripture, so it materially provides for a recognition of additional books, and thus for a canon of Scripture. "Nowhere does the Bible say it is the supreme judge of all doctrinal controversies. Nor does the Bible say that decrees of councils and other such authorities are subordinate to Scripture,"
Actually, that is what Scripture does reveal as seen in the abundant references which overall evidence it to be the supreme transcendent standard for obedience and testing Truth claims. Scripture and Westminster also affirm the church as judging doctrine, but not based upon the premise of Rome's assured perpetual formulaic infallibility, under which it defines itself as being so. Rather, what Scripture reveals is that, as in the case of Israel, both the instruments and stewards of Holy Writ are to be subject to it, as even the inspiration of the writers did not extend to everything they wrote or said on faith and morals. Nor did they always understand what they wrote. (1Pt. 11:1) Thus the church began because Scripture was of God, as was a Man was whom Scripture promised and attested to, but who was rejected by the instruments and stewards of Holy Writ. (Rm. 3:2; 9:4) And Rome has also wrongly judged and slain men of God, even if they were less than the Christ in whom they believed. This requires overcoming the competition by Scriptural substantiation in text and in power, as the apostles showed, (2Cor. 4:2; 6:1-10) such as the preaching of the evangelical gospel does in resulting in manifest regeneration among those who believe it out of a broken and contrite heart. To God be the glory.